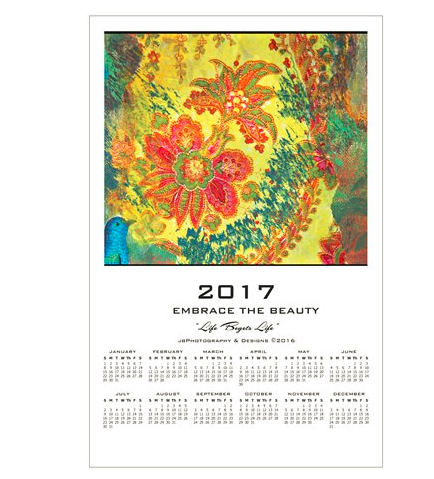 2017 Embrace the Beauty – Nature’s Glory desk and wall calendars. Each month, you will enjoy the ageless beauty from many historical places encompassing Northern California to the Oregon Coast as they are truly nature’s glory! ​“Life Begets Life” notecards and 2017 poster calendar. A compilation of images from a large mixed media painting created this summer that is a fun, colorful explorative piece that includes my own imagery, as well as, found objects, papers, etc. ​All cards and calendars are available for purchase. Fill out the contact form to request pricing and details.